Chelsea Nenni recently sat down with Shambhala sangha member and teacher Lodro Rinzler to discuss his most recent venture, the Institute for Compassionate Leadership. Primarily targeting the millennial generation, it is the only leadership institute to combine executive coaching, mentorship, and job placement under one umbrella. As it is based partly in Shambhala principles, Chelsea teased out how this fledgling non-profit came to be. Chelsea Nenni: A year and a half ago your first book came out, The Buddha Walks into a Bar. A year later you start your own non-profit. Is there any connection there? Lodro Rinzler: After The Buddha Walks into a Bar came out I traveled to 36 cities as part of the book tour. I spoke at Shambhala Centers, universities, and bookstores. Everywhere I went young people came to me with questions about how to live a life with intention and how to find meaningful work. The institute came, in part, in response to seeing that need. The Institute for Compassionate Leadership was founded so that young people who are inspired to create positive change in the world receive the training to do just that. CN: Can you give us the nutshell version of what the Institute for Compassionate Leadership does? 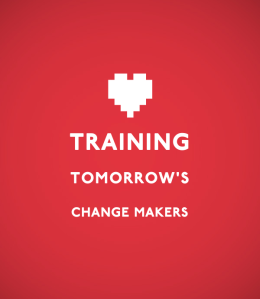 LR: It’s a training program that helps young people discover their purpose and empowers them to do meaningful work. We match each of our students with an executive coach who helps them identify their calling, whether they want to focus on immigration reform, anti-poverty work, whatever. Then we get them a mentor in that field. Over our six month training program the students learn practical skills taught at MBA programs and other leadership institutes, but we match it with mindfulness meditation training based in the Shambhala tradition and organizing training so they learn specific tools for how to work with diverse communities. Afterward, we network like hell to get them a job in that field they desire. CN: I understand the practical nature of offering traditional leadership techniques but it’s somewhat unusual to think of mindfulness meditation as a tool for developing into a leader. Can you say why that’s included? LR: My big hope for my first book was that some young, smart person would read it and start meditating and then, over time, take on leadership positions. Maybe they would work at Goldman Sachs and rise in the ranks there. And maybe over several decades they would rise to a CFO position. But because they had been meditating for thirty or so years they are more self-aware, empathetic, and kind and able to wield the power of that position with compassion. That was my initial goal. The idea with the institute is that we can offer this transformational meditation practice, alongside teachings from the Shambhala tradition, to empower young people as the leaders this world needs. Graduates are not just trained in real-world skills (although they certainly are) but have this important tool to help develop as more thoughtful, mindful individuals. CN: There’s one more element of your curriculum you mentioned which is the organizing training. Is that connected to your work on the Obama campaign? LR: Yes. The Institute for Compassionate Leadership was founded after the passing of Alex Okrent, a dedicated asset to the Obama cause and a pioneer in creating social change through his ability to love and be compassionate. Alex was my best friend starting in college and, after his passing last year at the age of 29, I worked with my grief in part through moving to Ohio and working non-stop to continue his cause. I was touched, however, when I discovered the authentic relationship practices the campaign was founded on. The model that was used, known as their “ground game,” is one that is based in going into diverse communities and learning from them and empowering individuals in those neighborhoods to create lasting social change. That is compassionate leadership right there, and we are incorporating that philosophy in our work. CN: What does an institute graduate look like? LR: The core of what the institute does is train people to be authentic to their own leadership style and compassionate to others. Graduates emerge from the program more self-aware, confident in their sense of purpose, and empowered with tools to create lasting positive change in the world. They will go on to become the next generation of public servants, non-profit directors, social entrepreneurs, and enhance private corporation leadership. CN: Last question: how can interested individuals get involved in the Institute for Compassionate Leadership? LR: There’s four main ways to plug in at this time. The first is to become a student. You can check out our website and see if this program is right for you. The second is to send our info on to someone who would make for a good student. The third is to become a mentor – we are accepting people from all different social change fields into our network at this time. The fourth (and I’m not going to sugarcoat this) is to become a donor. 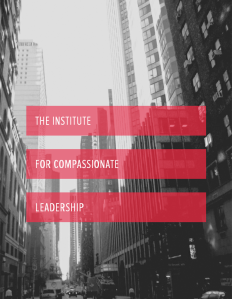 The Institute for Compassionate Leadership is committed to supporting every qualified applicant who is interested in the training and placement process, regardless of their ability to pay. With that in mind, we are looking for individuals to sponsor our inaugural class so they can partake in this program. It’s shaping up to be a diverse group, ranging from graduates of four year universities to inspiring and brilliant homeless youth in New York City. In order to offer them this training we will need to raise money this summer. We have just squared away our legal status and can now begin accepting donations. Thank you for taking the time to talk to me about the institute. For potential students the application process is now live and interested donors or mentors are encouraged to visit thewebsite to learn more. To contact Lodro directly you can email him atlodro@instituteforcompassionateleadership.org. Reposted with permission from Lodro Rinzler. The original post can be found on the Shambhala Times website.